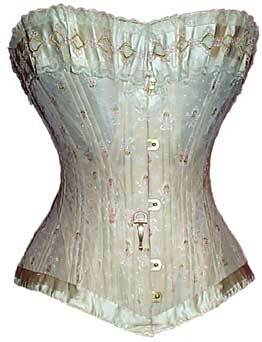 Imagine an old-fashioned corset with whalebone insets. The different thing about this corset is that sharp teeth have been embedded into the whalebone and pierce the skin of the person wearing it. That is what I experienced early in my week-long (so far) trial by shingles. Now it sort of feels like I have ten broken ribs and every so often a random one tries to poke through. This is a vast improvement, although I still cannot move without pain, breathe without pain, exist without pain. I am not a person who deals efficiently and stoically with severe pain. Yet I have had to endure it, because OTC pain relievers like Motrin do not touch this pain. And my body has no tolerance for most opiates. They make me very ill and the last thing a person needs when her ribs feel broken is to be heaving over a toilet bowl. Day 6, yesterday, the pain began to subside. Either that or my doctor finally found a pain pill that semi-works. The course of anti-viral I’ve been on for a week is almost done. So, IMO the pain should be almost gone. It’s not. It feels like this will never be over. I have no idea how people who have medical conditions that keep them in pain all the time cope. If this becomes chronic, I will be looking into medical marajuana and moving to a state with legal euthanasia. I’m having a difficult time reading, can’t write for crap, and even talking on the phone hurts. I can’t even sit in my favorite reading chair. All I can do is lie on the sofa or tuck into bed while listening to Ainsley McLeod’s soothing voice discuss karma, reincarnation, spirit guides, and how past lives impact our present existence. That guy is the best medicine. Before the shingles descended, I was already having sleep issues, but they were passing. I was getting better. Now, I get maybe two hours of sleep a night and writhe in agony the rest of the time. Poor Al. I should move upstairs for the duration. But, you guessed it, I can’t climb a stair. However, I have hope. A new sleeping pill got me 7 hours of shut eye last night. It’s amazing how much better I feel just for having finally gotten some sleep. Ironic how as I begin to feel better my doctor hits on the correct meds. The other thing bringing me so low isn’t ironic and it’s not bad karma but damn you know I just spent a month not walking much. The knee thing was not a world of hurt like this, but still, I was pretty much immobilized. And so fate or the universe or some cosmic trickster adds another week, and this one with a deadly sting. Probably I am overdoing the drama but think I said, I’m no good with pain. Perhaps in a past life I was tortured in that room in the London Tower where you can never sit, never stand, never lie down. I feel broken. It’s hard to believe I will ever be whole again. I was able to keep positive for more than a month, visualizing getting well, climbing my mountain, but shingles makes me feel like I’m falling apart. So my advice to you is get a vaccine for shingles. Especially if you are over 60. 20% of the population over 60 will get the shingles virus. As I just explained, it is a picnic crawling with biting ants that cover your entire body inside and out. Next morning I woke up and there were more bumps marching in a belt pattern across my torso. “Shingles” appeared in my brain. Thanks, guides. (Honestly, this practice works. Whether it be intuition or angels or guides or good sense, if you have a tough question, ask for the answer. You’ll get it every time.) I made an appointment with my doc that same day and quite possibly saved myself some time in that cage of pain. The quicker you catch it, the sooner you get on the path to recovery. Yes it’s a road filled with thorns, but I gotta believe it leads back to radiant health. Thank you for your compassion Jackie and yes poor Al! He’s been very patient with the patient:) Thanks for the anti-oxidant tip. I am going to eat nothing but for the rest of the day. This is so unfair. Just when things were looking up after the knee business. Sending you all my patience today, I shouldn’t need it as I usually get along fine without it! Shingles is bloody awful. Can’t even send a hug in case it hurts, but consider it sent. Thanks Sue. Yes, seems unfair that even hugs hurt! To damned right it does… just when you need them most!